Better than a poke in the eye with a blunt stick (because that would hurt EVERYONE). There is normally a large and exhaustive range of tests that people undergo on their journey to get a diagnosis. But the simple diagnostic test for Fibro is pretty straight forward. Prod someone in various parts of the body. 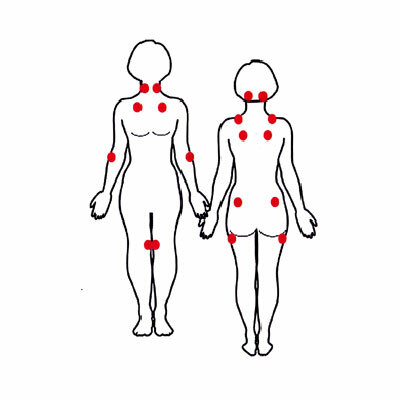 If 11 out of 18 points, spread over the body are tender or hurt and have hurt for 3 months or more you have Fibromyalgia. It an important test and understanding it is really important. Unfortunately what some people take from the widespread pain finding is that their body is ‘broken’ all over. This couldn’t be further from the truth and I hear it enough that I thought it would be useful to discuss the test. The most important thing to take from this is not that the bit that hurts is damaged in any way. That is the mistake people often make. The problem is the nerves taking information to the brain about the state of the body are amplifying the message. The body is fine but the message getting to the brain is that it is not. This is where people start thinking I am saying that Fibromyalgia is all in the head and not a real illness. So here is a bit of basic neurophysiology that might help. So the nervous system becomes hyper-senstivie. Like the Princess and the pea story, being hyper-sensitive can lead to unnecessary unpleasantness including a poor night’s sleep which is a major issue with Fibro. The muscles will also tend to tense more than they need to and stay tense for longer than they need. But how does hypersensitivity tie in with Pain? You might think that the pain message is getting exaggerated but it isn’t quite the case. Pain messages don’t travel up the nervous system. It’s only information about the state of the body. So it is THIS message (the prod message for example) that is getting exaggerated. A light prod message gets to the brain and the brain perceives it as a large nasty prod. The next step is pretty straight forward. We now know that pain is 100% of the time in the brain. Pain is a brain’s response to the assessment of a threat. So when the nervous system is hyper-sensitive, ‘safe’ messages gets read as ‘dangerous’ and the brain responds inappropriately. Central Sensitisation has the brain putting a threat value on safe things. So it is an issue with the nervous system sensitivity and brain processing. It sure feels like it is broken (and is the exact same pain messages as if it was broken) but it is not. To treat Fibo, patients are often given anti-depressants. This is often not well explained and people are left feeling like the doctor thinks they are crazy or depressed. The aim of the anti-depressants however are to attempt to dampen the sensitivity of the system to hopefully correct the amplified messages getting to the brain so the brain doesn’t turn the pain on. For this same reason it can help with sleep. (People on anti-depressants often feel ‘flat’ or numb’ as a result). But success with antidepressants is minimal and the side effects for some make it not an option. Luckily the brain and the nervous system are highly and rapidly adaptable without drugs. We are of course a little more complex than the sea snails used in the Nobel Prize work but we have also learnt a lot since then. One of the things we have learnt is that after a period of time in pain, there are changes in the brain that also have to be addressed. Calming the nervous system is often not enough which is why drugs are often not effective for longer term pain. You can calm the nervous system but the brain has ‘learnt’ that pain is appropriate and continues the pain message. So it is a two step process. Normalise the sensitivity of the nervous system and retrain the brain to respond appropriately rather than historically. So the work I do requires people to be willing to take a broad approach to address reasons why the nervous system is hyper-sensitive and also retrain their brain to respond appropriately rather than historically. Some of the work revolves around the role stress hormones play in creating synaptic sensitivity, beliefs, behaviours, emotions, poor sleep and immobility and past traumas. We also can work with a range of techniques that specifically target how the brain is processing information to help turn off the pain message. This video is a simple over view of chronic pain in general and explains why the best approach is a patient driven broad approach to retraining the brain and nervous system. It needs to be patient driven because what is driving the sensitisation in one person will be different from the person sitting nest to them with the same diagnosis. So hopefully the take home message from a diagnosis of Fibro is not that your body is broken. It is the focus on the body that often leads people down a rabbit hole of treatments and moving into ongoing management mode. The really exciting news is that nervous system sensitivity and the brain function is highly and rapidly adaptive.